Check out my video breakdown of Georgia cornerback Deandre Baker. 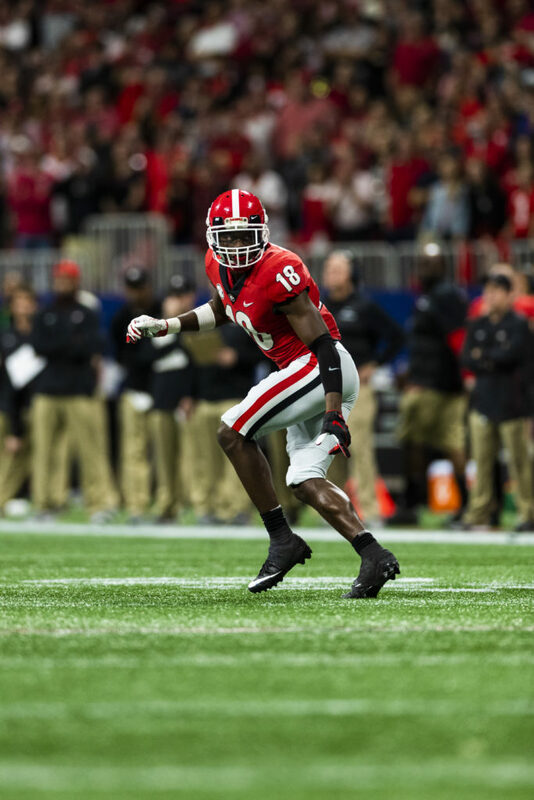 The strengths and weaknesses of Georgia CB Deandre Baker. Niners would have to trade back multiple times, and trade back deep, in order to select a CB in the first round. This goes for Greedy and Murphy, too. Weakness: Off field concerns, poor interviews, lack of zone experience. Really loving these video breakdowns, Grant. You’re setting yourself apart from the competition…. Too many weaknesses for a 1-3 round pick. Maybe in the 4th. Spot on breakdown Grant. My thoughts exactly! With round 1 of the 2019 NFL draft officially 3 weeks away, I think it’s the proper time for an appropriate avatar! Still want to see analysis and assessments of Brian Burns ,JJ Arcega Whiteside and Clelin Ferrell. These breakdowns are very informative, and I like how Grant relates how a player will fit into the Niners’ schemes. If that motherf**ker attempts to do his stupid little spin kick on us, I’d take the penalty and have one of my guys knock him on his keister mid spin. I hope the Niners run right at him. On Reaser…. One the very first NFL signings of an ex-AAF player. AAF may be gone, but some players will find opportunities. Haha Sebbie! That would be ‘one of’… To much in a hurry. Oh, Cassie, did you hear the news? Maybe you should be sitting down first, before I try to gently break the news. I know how emotionally involved in this league, you were…I mean, are. Some guy put up 250 mil to help start a league. Guess he lost his shorts.You were claiming packed stadiums of over 30,000 fans, but the real total was around a paltry 10K. The tip off was when they could not meet payroll, after 3 games. So sorry to break the news, that the AAF- The Amateur Apathy League, folded like a House of Cards. Go ahead and tout Reaser, a Baalke ACL Player. Yes, they will be signing players, even ones sitting on a couch. Happens every year. Excellent breakdown Grant. You hit on several of the concerns I have with Baker and why I don’t see the 49ers drafting him even if Baker falls into the second round. Who is next prospect that you will be breaking down? Greedy Williams. Then, back to the edge rushers and wide receivers. A Miles Boykin, WR, Notre Dame analysis would be great too! He checks all the athletic boxes and I keep hearing his bad production was a result of bad QB play during his time at Notre Dame. I plan to do him, too. You’re doing a good job making me question my impression on players! I really like Baker as a player, but yeah, those weaknesses you point out are definitely concerning. Ha, thanks. I really liked Baker before I did this breakdown. Didn’t expect to see the things I found. You’re popping a lot of draft bubbles Grant, but I guess the more opinions the better. No doubt after Grant looks at Boykin I will be all on board with him! You’ve covered a lot of CBs, speaking of LOTT, What about Rock Ya-Sin, who has been compared to Ronnie Lott in hitting with force…? Got speed and attitude…? I’d like to do him, too. I’m going to do as many players as I can before the draft. I wish I would have started this earlier. Next year, I will. You should have plenty of time. There’s still 21 days and just over an hour until the first pick. Second on Rock Ya-Sin. High on him, though there were concerns about his Senior Bowl practices. I also second all the comments on the great work you’re doing on these video breakdowns Grant. I believe Lynch will grab a CB, but on day 2-3. We have young DB plays in tow that have not had the decent amount of time to prove themselves. Many of them were thrust onto the field last season because of injuries and other starters whose play declined. If there are any authentic shutdown CBs in the draft there is a good chance that they will be gone by the time we roll in the 2nd rd. I would rather we get our WR in rd two. A pure pass rusher with our 1st pick is going to significantly help our defensive backfield. Here’s my projection of the first 3 rds. These break downs have broadened my football knowledge, very cool! And I do enjoy them a lot. But for me it is your written work that shines. This new feature is a game changer. For one, it will help to cut down on the arguments and debating. And will also help someone like me get better acquainted with all the language and nuances of today’s game. Thanks, Hacksaw. I’m shooting as many prospect videos as possible before the draft. Usually, I’ll shoot only one video a week. I’m talking after the draft. Before the draft, I’ll shoot out as many as possible. * Really enjoying your draft prospect video breakdowns, very informative. have never seen before. thanks for making that possible! In other news, earlier today, Kwon Alexander changed his number to 56, Foster’s old number. He wore No. 58 in Tampa. That wasn’t the only San Francisco 49er to get a new number. Starting linebacker Fred Warner is also changing it up in 2019. Warner will go from No. 48 to No. 54. Seems like 50’s is a good LB number but some people probably like Warner in No. 48. Former Carolina Panther David Mayo will wear No. 59. Former Philadelphia Eagle Jordan Matthews will wear No. 81. That’s Trent Taylor’s old number. Trent will wear No. 15. Former Atlanta Falcon Tevin Coleman will wear No. 26. Dee Ford is still undecided. He wore No. 55 for the Kansas City Chiefs. That number is currently being worn by Pita Taumoepenu. I imagine for the right price, the number is Ford’s. Pita wore 50 in college. Jason Verrett is also undecided. I can’t believe a couple weeks ago he requested to wear No. 21. He was told by the team “if you get Frank Gore’s blessings, it’s yours.” Verrett has since changed his mind. There aren’t many other options that look like “CB numbers” for Verrett, who wore 22 with the Los Angeles Chargers. Hmm, does that mean JL is angling to trade for Frank Gore? Niners should offer Jerrick McKinnon for Frank Gore and 4th and fifth round picks, (112, 147) of the Bills. The Bills have extra 4th and 5th round picks, this draft. Niners need to make room for Gore, and they probably want to ditch McKinnon’s salary. Niners expressed interest in moving McKinnon, so while improbable, it is not impossible. I would add one more concern based in those clips. No Jam – he never seems to get his hands on the receiver in the first 5 yards when it’s actually legal to do so. This would help a ton with those inside releases. Concerns for sure, but I love the way he uses the sideline. He’s great on deep balls moving the receiver to the sideline or OB. This defense is predicated on stopping the deep ball, keeping everything in front of you. I still think he fits that mold. More so than greedy. Who’s a man cover corner who has bad technique and superior athleticism imo. I think there is a chance JL takes this guy. Especially if he is there in the 3rd.